I came across this while working on another post. This 2005 article humorously attempts to explain the presence of the only red Snifit in the entirety of Super Mario Bros. 2. I’ve always drawn in my spare time, almost literally for as long as I can remember. I haven’t pursued the activity as anything more than a hobby, but I also haven’t ignored it. Some of you may know that I am currently Editorial Cartoonist and Comic Strip Artist for the Cardinal Courier, St. John Fisher College’s student-run (and award-winning) newspaper. I’ve held both posts since my freshmen year (after this summer I will be a senior, to put that in perspective), the second actually being created for me. The modest comic strip series I’ve drawn for the paper’s Lifestyles section for the past five semesters is titled Skip & Cal. Its titular characters, Skip Squirrel and Cal Cardinal, ideally represent not only the campus’s most prominent animal and its mascot (respectively) but often also the general thoughts and feelings of those who attend and work at Fisher. I’ve always wanted to have an online archive of my past strips (since the Courier’s chosen web platform makes it difficult for them to do it themselves), and so I will from here on out occasionally be posting one or two past strips at a time for your viewing pleasure (or displeasure, given the questionable quality of some of them. College students are busy, you know!). If all goes well, future strips will appear here as well. Before that, though, I wanted to properly introduce Skip and Cal as they appeared before the strip even existed, in three of the editorial cartoons from my first semester at Fisher. These were all hand-drawn by me, scanned, edited, and then each one appeared on the second page of an issue of the Cardinal Courier. Enjoy! My personal favorite, this cartoon (possibly) marks Skip’s first appearance and closely reflects the actual behavior of the many squirrels on campus. It’s amazing what you can come up with if you try, even if you’re a Creativity Nincompoop like me! 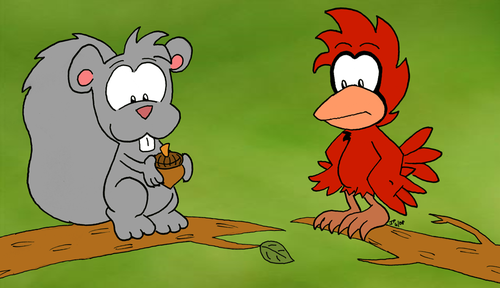 If you’d like more Skip & Cal, check out skipandcal.net, where I’ve archived all of my cartoons, including those starring our favorite squirrel and cardinal. But silly me: when I got back from London in December, I promptly went out and got an HTC Droid Eris, which is just like the Incredible but with much older, slower hardware and less-featured software (which notably was missing Google’s free GPS navigation). And now that I’ve used up my two-year discount (and can’t bum a family member’s for at least three months), I’m stuck with the Eris for awhile despite the Incredible’s obvious superiority. So, being left unsatisfied with what I have, what’s the obvious course of action? Just accept it and move on with my life? Nah. Let’s keep poking it! Being especially unsatisfied with the Eris’s lack of an update to the latest version of Android (2.1), which HTC and Verizon have kept on promising but not delivering, I’d been periodically checking up on smartphone news sites to see if the update would be hitting anytime soon. First I found out that the Droid Eris has been successfully rooted–that is, some clever folks had figured out how to access the “secret” parts of the phone that only HTC and Verizon would normally be allowed to get to, and thus anyone could put any kind of software they wanted on their Droid Eris. This tempted me, especially since I can never resist a bit of unnecessary tinkering, but it didn’t quite yet seem worth risking my first smartphone’s well-being (rooting can apparently brick a phone if you’re not careful) for little apparent gain. But then someone at HTC or Verizon messed up and an internal test version of Android 2.1 for the Droid Eris was leaked. The collective phone-hackers of the Internet jumped on this immediately, modifying the leak to work best as they saw fit and releasing their mods to be installed on any rooted phone. And it turned out great! I used the Sense-able 2.0 ROM on my phone, but there are plenty of other good ones to choose from. My phone is slightly faster than before, but more importantly it has all the new features of Android 2.1 that I wanted: Google Navigation, support for newer apps like Google Goggles, and little perks like being able to turn off the vibration “feature” on the soft-touch buttons. Most importantly, my tinkering itch has been scratched, and my urge for new-phone-goodness has been satisfied. If, like me, you have a Droid Eris or a similar older Android phone (like the HTC Hero on Sprint, which is really what the Eris is, disguised) and, like me, you’re frustrated with its lack of software goodness, then maybe you’ll take the plunge like I did and root that baby. Or if not, maybe you’ll be in luck if Verizon (and Sprint) finally release the 2.1 update in the next month or two as is being rumored (and as the fact that there are even update ROMs to be leaked suggests). Wait and see if you like, or take control of your phone like I did (as long as you don’t try to sue me if you mess it up). 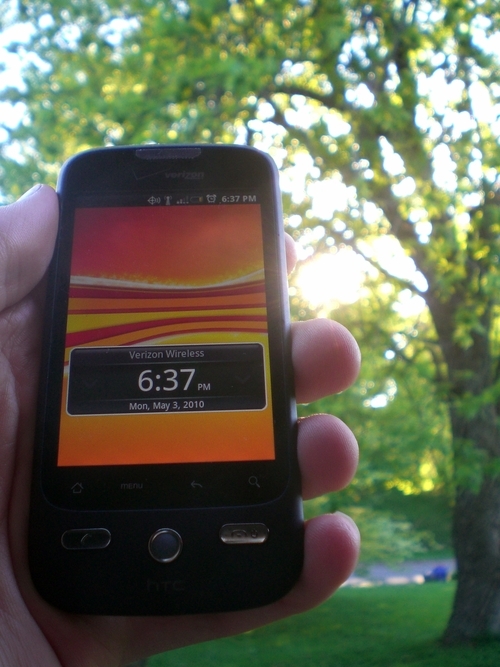 Update: A few weeks after writing this post, Verizon and HTC officially released Android 2.1 for the Droid Eris. Also a few weeks after this post, I managed to kill my phone by leaving it in a puddle of water on my bedstand overnight (Learn this: Dixie cups leak when reused. Bad for the environment anyway.). Tried buying a new battery, but that died eventually anyway plus the phone started having issues, like not always registering that it had been plugged in to charge. I deemed it no longer worth the effort, since my rural-suburban life currently has little use for a smartphone, and decided to forgo Verizon’s $30/month smartphone fee for at least until I graduate and move somewhere more urban. The plus side of all of this: I get to go back to using my awesome LG VX8700 again. Despite its “dumb”-ness, I did dearly miss that good piece of hardware and software.